Events, Pictures → News Director for Hubble (STScI) Visits My Studio! 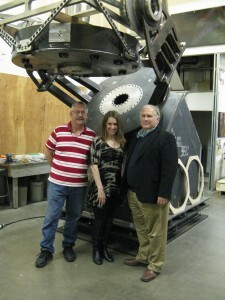 On Friday, January 14th, 2011, I had dinner with Ray Villard, the News Director for Hubble. It was great having a one-on-one conversation with him, and hearing the latest news. It was also fascinating to hear about how it feels to be the first ones to see the amazing, mind-blowing views Hubble brings us. 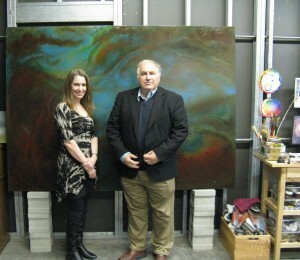 After dinner, Ray came to my studio to see my paintings of Hubble images. It was in 2008 that I was first inspired to create paintings based on Hubble images, and I showed him a selection of paintings from then until now. He also got to see my latest work in progress! Stacy Sakai and Ray Villard in front of the Magellanic Cloud painting.